In the United States, where more than a quarter of farmers are now over the age 65, a new generation of earth stewards is much needed. This alarming statistic has put the onus on young adults to consider careers in farming, sustainable living, and agriculture (1). While many millennials are feeling inspired to renounce office jobs in the city and turn to the rewarding work of growing food, this is a movement that still needs support. At the heart of Pacific Domes is a wish to make life more affordable, sustainable, and ecologically conscious. We’re proud to support young farmers on their bold endeavor to create a healthy future for the planet. In the summer of 2018, an inspiring couple out of Cincinnati, Ohio, shared their vision with us. Justin and Erin Meyer acquired two Pacific Domes to serve as the fulcrums of their new farm site, a beautiful slice of land they call “Dark Horse Acres.” This place, Erin explains, will be “a community learning center and regenerative healing farm” where they will utilize the principles of permaculture and biodynamics. Construction of the 36′ dome that became Erin and Justin’s home. This spring they will open the door of their dome to various workshops such as mushroom growing, permaculture, biodynamic beekeeping, and forest bathing (Shinrin-yoku). However bucolic the fantasy may seem, it has become increasingly clear that “living off the land” is one of the most beneficial lifestyle choices that one could make. It is not only a big key to global health and sustainability but also to personal wellness. Even embracing a little of this lifestyle (i.e. home gardening) is proven to reduce stress, boost self-esteem, and foster a sense of community for those who share their product (2). 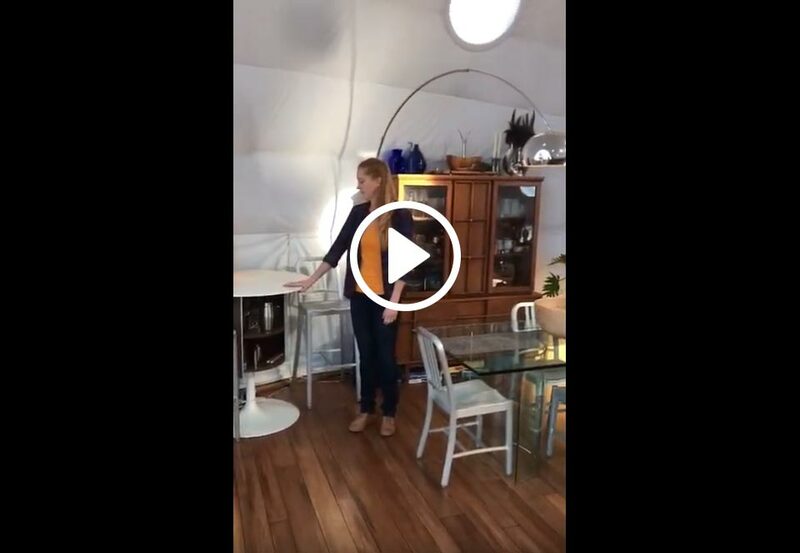 The large baywindow provides natural light and passive solar warmth in the winter when the deciduous trees loose their leaves and allow more light to enter the dome. Erin and Justin have been cultivating their vision since 2017, when they planted over 50 fruit-producing trees and bushes to kickstart their food forest system. Their workshops will give the community a chance to help in the development of the land, while also providing an opportunity to learn the biodynamic approach to farming, gardening, food, and nutrition. Before building their 30 ft workshop dome, the couple had fun constructing their own 36 ft dome home to live in while founding the farm. 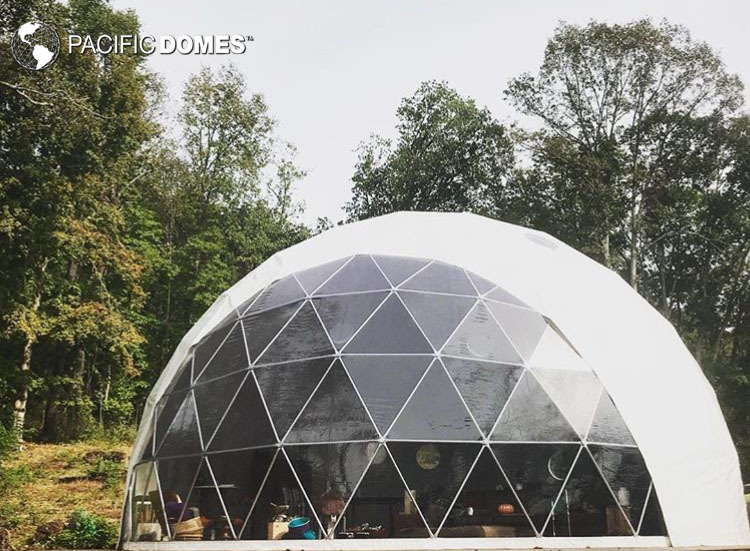 Consciously placed on the land with stunning views of the Ohio River, the couple has transformed their dome into a fully functioning living space that is set to last through the long Ohio winter. In addition to the insulation that we provided, they incorporated a mini-split ductless system to keep their dome dwelling at least 30 degrees above the cool outside temperatures. They are also installing a wood burning stove, intentionally set to reduce environmental impact by using downed trees on their land for fuel. 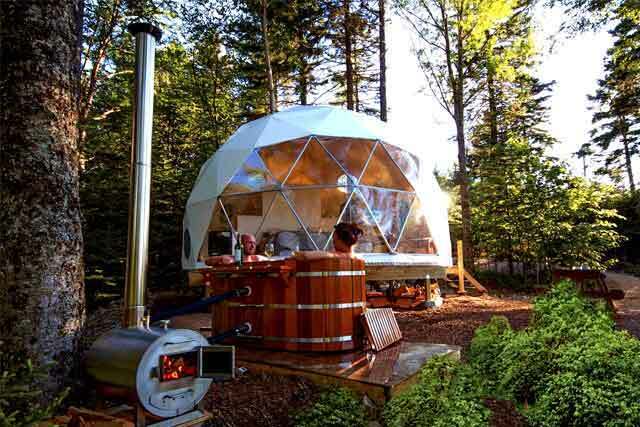 The winter liner installed in this 36′ dome not only creates a soft look and feel, it also insulates against the elements. Their focus on functionality is balanced by a creative upcycling style, having found unique pieces to define each section. Their kitchen, for example, features an elegant use of an old bowling lane that they’ve refurbished to serve as the main island. Underneath, they are able to store all the appliances that might be used for the canning and processing of their harvest. Most of their furniture is mobile and versatile, allowing them to change it up and evolve over time. 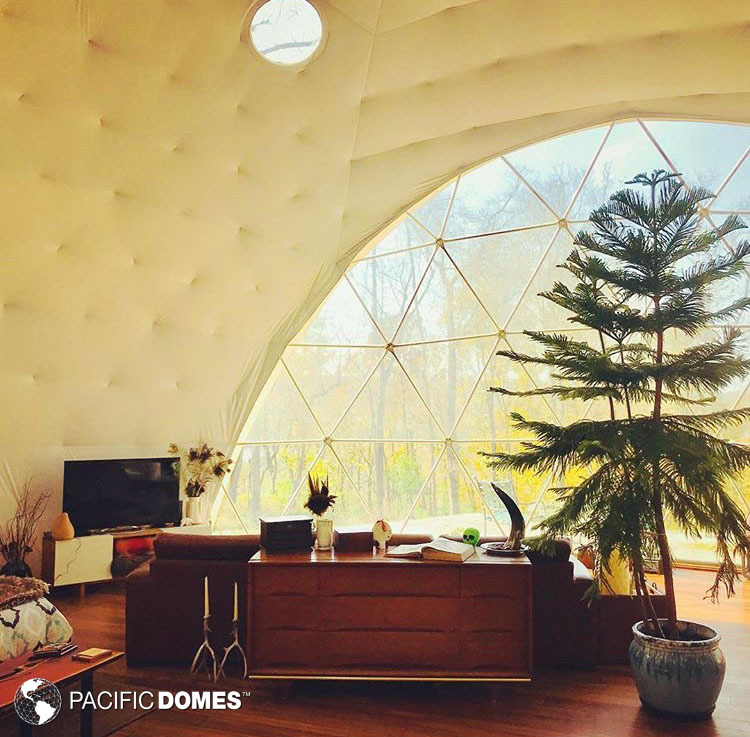 Equipped with WiFi, ambient lighting, stylish decor, and polished bamboo floors, their 36 ft dome home is a dreamy nest that’s perfect for their ecologically-minded lifestyle. Dark Horse Acres is a shining example of conscientious earth stewardship, a much-needed model for a sustainable communities nationwide. Their plan to immerse their visitors in nature and share their knowledge of regenerative ecosystems is going to change the lives of many. They are doing their part to change the narrative of farming, which, for too long, has stigmatized the work of agriculture as back-breaking labor, instead of showcasing its many benefits. Since 1980, Pacific Domes has helped support various “domesteading” projects worldwide. 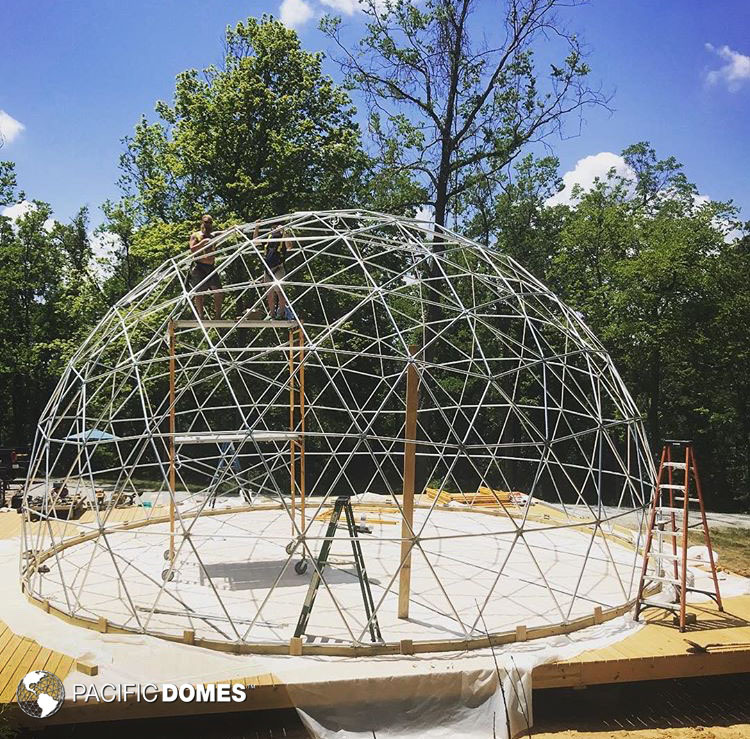 We construct carefully designed Greenhouse Domes, as well as Dwell Domes, for intentional ecovillages and micro-communities. Connect with us to learn more about our options for young farmers. Together, we can do our part to regenerate a diverse, holistic, ecological approach to growing our food and our communities. “Replacing the Unsustainable Culture of Control with the Nurture of Nature” — Pacific Domes Inc. Previous Post:Adult FOMO! Happy Place on tour!